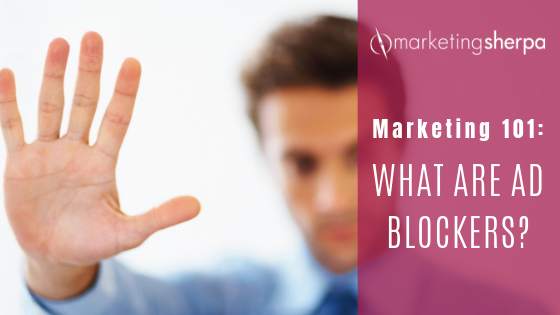 Marketing 101: What are ad blockers? Marketing has a language all its own. This is our latest in a series of posts aimed at helping new marketers learn that language. What term do you find yourself explaining most often to new hires during onboarding? Let us know. Ad blockers are software that, as the name suggests, allow web users to block the ads on websites. Ad-blocking software (also known as ad filtering) can take different forms — from a web browser extension or plugin like AdBlock Plus to a standalone browser like Brave. While ad blockers have gotten more attention lately, they are not new. For example, MarketingSherpa published a story on them back in 2001 — Should Publishers Worry About Ad Blocking Software? SaveTheFreeWeb.com’s Bill Dimm Explains Reality. Ad blockers have been a difficult phenomenon to deal with for publishers. 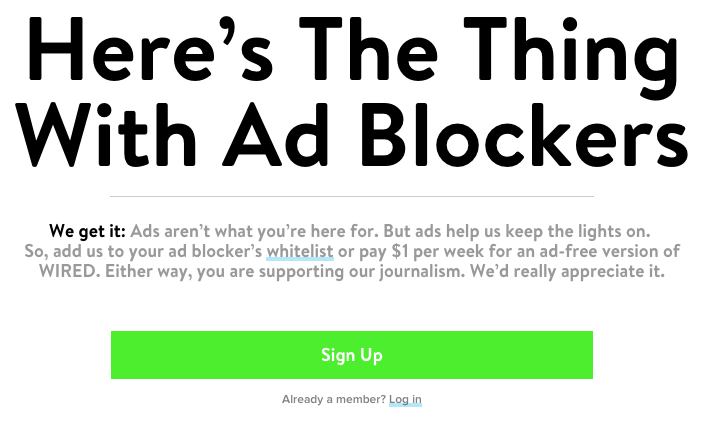 For publishers, ad blockers threaten to steal advertising revenue. Some online publishers have adapted by either forcing visitors to allow ads or pay for a subscription to see their content. Here is an example from WIRED magazine. The world is moving away from a standard view of advertising. Back in the ‘60s and ‘70s, advertising was fairly easy to identify. But what is it today? And what will it be tomorrow? These are the challenges that have been facing the advertising and marketing industry for at least the past decade. What should advertising be in the future? How do we get there? And, most importantly, who can answer these questions? 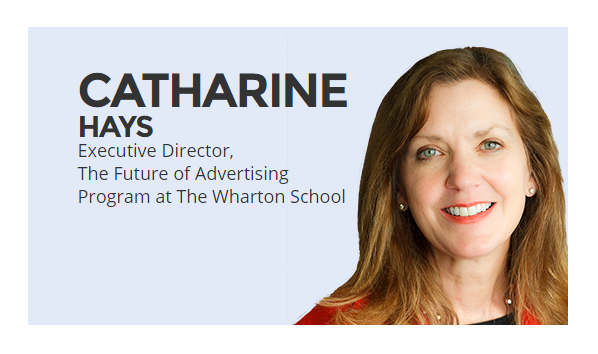 So in 2008, Catharine Hays teamed up with Wharton’s SEI Center for Advanced Studies in Management, founded the Future of Advertising Program at the Wharton School, and began assembling what would be a team of 200 advertising, marketing and academic leaders at organizations ranging from Facebook and Google to Tsinghua University and NPR. Research from this who’s who of the advertising and marketing industry ultimately informed the publication of Hays’ book (with co-author Jerry Wind, Director, SEI Center for Advanced Studies in Management), Beyond Advertising: Creating value through all customer touchpoints. Catharine’s research intrigued us, and I’ll be interviewing her on stage at MarketingSherpa Summit 2017 in Las Vegas. As we prepared for that session, we chatted about these challenges, and I wanted to share a few of the lessons I learned from that conversation about her research. I just finished an article on click fraud and found some interesting numbers. A large majority of marketers seem unconcerned with click fraud.